Whew. 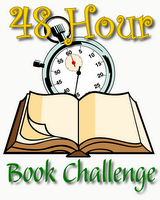 The 2008 48-Hour Book Challenge has come to an end for me. Of the past 48 hours, I have read and blogged for 26.25 hours. Some parts were harder than I thought they would be, some parts were easier than I thought they would be. My total reading and blogging time was 26 hours and 15 minutes. Prey by Michael Crichton - I had read about half the book before the challenge started and during the challenge I read 278 pages (I'm counting it as .5 books). I read a little bit of Pure Dead Magic by Deb Gliori, but decided that it wasn't really my cup of tea. And I read a little of Knights of the Hill Country by Tim Tharp, but I wasn't going to be able to finish it in the time allotted, so I switched books. Since I didn't review either of these, I won't count them in my final book/page count. I had a strategy originally. I had checked out a bunch of short books (200 pages or less) theorizing that it would be easier to read a bunch of short books than to get mired up in longer books. For me, that strategy didn't work so well. It was way easier for me to read books I had really been looking forward to and was really interested in, even if they were longer books. When I was getting through the shorter books, I kept checking to see what page I was on and they were dragging on and on... When I picked up the books I was really interested in (like Prey, The Sea of Monsters, and The Fold), they flew by because the stories were so interesting that I would forget to check the page numbers. So, if I do this challenge again (and I would like to! ), I'll remember to pick books I really want to read. Which brings me to the next thing... Checking other people's blogs during the challenge can be a fun way to get some inspiration, but it can also backfire. Like when you see that someone read Rumors in 2.5 hours and it's taking you way longer and then you start thinking that you need to be reading faster and you're never going to keep up with everyone else and... etc. etc. So... while I think it's great to check up on everyone's progress and especially to leave encouraging comments (which I will do more of next time, promise! ), don't let yourself get discouraged because that's not the point! Hats off to Mother Reader who thought the whole thing up and organized everything and is generally awesome! And now I am off to not-read for awhile. Congrats to everyone who's made it through and a big YOU CAN DO IT! to anyone who's still going! I found it a little stressful, too. Kudos to you for dropping the stressful part. But it's funny, I found for me the short book strategy worked better - the couple of longer books that I read felt like they were dragging, even though they were good books - I guess I just set myself a rapid pace, and I needed the book completions to feel satisfied. Anyway, it's a learning experience, for sure. I purposely didn't read any (or hardly any) blogs during the 48 hours, because I knew I'd feel inferior. I managed 20 hours, which was my goal. And for me, that worked better than any arbitrary book or page number goals. Hey! We both read The Fold! It actually took the pressure off me to see that people were attaining numbers that I would never achieve. It let me enjoy my last few books a bit more. Yeah, I'm nowhere near the big leagues in number of books or pages read, but that's okay, I still enjoyed myself!